In an earlier post, I mentioned how hard slang words make understanding any language. What's even trickier though, are idioms. Online dictionaries describe idioms as "a group of words established by usage as having a meaning not deducible from those of the individual words". We have many in English. For example, imagine how an expression like someone feeling "over the moon" would be received by a new English speaker. Or perhaps that someone "saw the light". 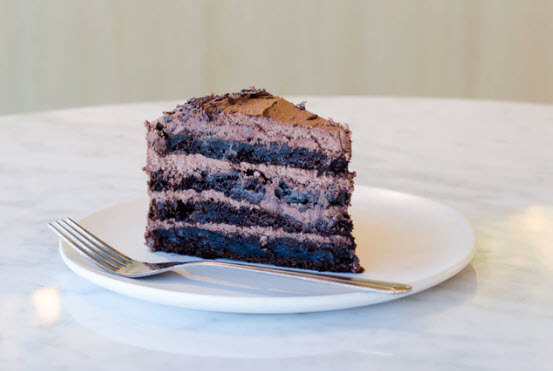 Or it was "a piece of cake". Chinese has these of course, along with a great number of old sayings that have current meanings. Some phrases have meanings that make some sense but aren't easy to derive. An example would be 马上 (Mǎshàng). The first word means "horse" and the second word means "on" so it's literally "on horseback". Currently it means "as soon as possible". You can imagine that at some time in the past, sending something on horseback was the quickest way to send it. Less obvious are phrases like 马马虎虎 (Mǎmǎhǔhǔ). This is literally "horse horse tiger tiger". It is a phrase that as an adjective means "careless" or as an adverb means something like "so-so" or "just ok". Another example of these is 指鹿為馬 (Zhǐlùwéimǎ) is to "call a deer a horse" and meaning "to deliberately misrepresent something". A wonderful one literally means "a frog in the bottom of a well". I'll leave that one to the reader to work out what it actually means. Regardless, if slang is hard, idioms are harder. A good example of the difficulty in the last step is a word like "sick" in English. When you are first learning English, it's pretty clear that it means "ill". But various generations of teens decided it could also mean "really good". Think how confusing that is to a newcomer to the language. I strike the same issue with Mandarin. While my mother in law speaks Mandarin, she doesn't use it much on a daily basis, and there was a cutoff point many years back where she basically stopped learning it. By comparison, most of my teachers are twenty-something women in China. They speak very differently to my mother in law and this is where the impact is felt. As a simple example, a word like "awesome" or "wonderful" could be expressed as 太棒了！(Tài bàngle!). Literally translated to English, the first character is like "very", the second character is like a bat that you hit a ball with. Baseball is 棒球 (Bàngqiú) or bat ball. The third character signifies that an action has completed. It's not quite a past tense marker but it's a bit like that. It might even make sense in English if you think of something "as a hit". However, another common expression is 太牛了 (Tài niúle). Same first and last characters are used. Now Google Translate shows that as "too bad" but I've never heard it used that way. Generally, it also means "awesome". Now, here's the catch. The second word means "cow". So the phrase really literally means something like "too cow". So you can understand the expression on my mother in law's face the first time I said that. There was this curious look, where she understood the words I'd said, but had no idea what they meant. People who haven't spent time learning about Chinese often presume that there is one core language, and perhaps a series of local variations, much the same way that this happens with English and, likely, all languages. The challenge with Chinese is that when you refer to "the Chinese Language", you are referring to a family of languages, not to a single language. There are many things that the Chinese dialects share in common (for example many can use most of the same written characters) but it's important to understand how very different the dialects are. In English we use pretty much the same characters that the French and Germans do. We could even guess how many words would be pronounced (but likely get that wrong too), but being able to read English doesn't give you much help in reading French or German. The exceptions to this will be words that have a similar origin in the past, or words that have been "borrowed" from either of those languages. As an example, you might hear an English speaker say "adieu" and understand it as "goodbye" but only because we've borrowed it and use it within our own language. Chinese has over 900 dialects. Many of the dialects are somewhat mutually intelligible to some degree. These are usually part of dialect groups. Chinese has eight of these eight major dialect groups: Mandarin (Putonghua), Cantonese (Yue), Shanghainese (Wu), Fuzhou (Minbei), Taiwanese (Minnan), Xiang, Gan and Hakka. Each has many sub-dialects. Importantly though, the really common languages like Mandarin and Cantonese share some common sounding words, but are largely mutually unintelligible. In some cases, you can tell that the words have some sort of commonality in the past. For example, the word for Red in Mandarin is pronounced as "hong" and in my wife's Teo Cheu dialect , is pronounced like "ung". ("Teo Cheu" itself is normally pronounced closer to "der jill"). Clearly there's something similar there from the past, but if you heard one in isolation, you're unlikely to work out what the equivalent is. Other words are completely different. In her dialect, the sentence for "don't yell" sounds very similar to the Mandarin for "as soon as possible". 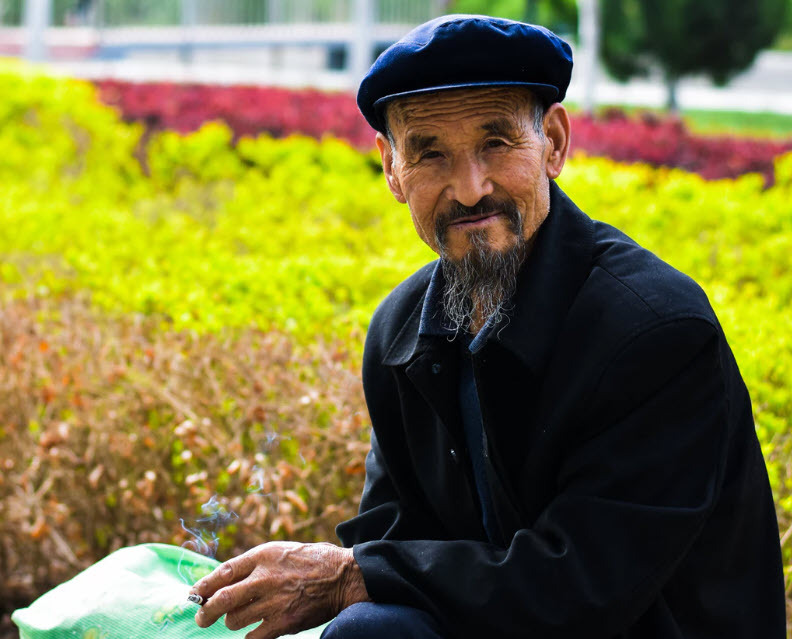 In the long run, I can see Mandarin becoming the core dialect and the others falling by the wayside, much to the obvious disappointment of the speakers of those other dialects. It will take time, but I see it as inevitable. Given the number of people the Chinese government needs to manage, a common language is essential, and they've made it clear that's Mandarin. Learning Mandarin: Should I use Pin Yin while learning? Now when people start to learn Chinese, it's tough to tackle both at once, so the usual starting point is to use what's called 拼音 (or Pīnyīn). Pīnyīn is a schema for Romanizing the characters, basically so they are familiar to people who use alphabets based on that, like English. So instead of writing 我喜欢学中文, I could write Wǒ xǐhuān xué zhōngwén (meaning I like to study Chinese language). Clearly, for someone coming from a language like English, the latter is much easier to work with at first. However, even though the letters look familiar to us, it's important to note that the pronunciation of them is a bit harder to get used to. For example, the Wǒ is pronounced more like war than woe, and xǐ is pronounced more like she. Also, many of the sounds that are used aren't exactly familiar in English. 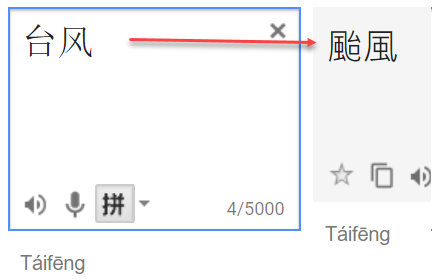 For example cái (or 才) is pronounced closer to tsai than to kai. Once you get over that though, it's certainly easier to get started with. A big challenge though, are tones. I'll write more about them another day, but notice the symbol (umlaut) over the letter o in the word Wǒ (which means I). This indicates that the word is pronounced with the third tone called 三声 (or Sān shēng). It's critical to learn to get tones correct pretty early on. In terms of Pīnyīn though, my advice is to try to start reading the Chinese characters as quickly as you can. I remember clearly the day I decided to turn off the Pīnyīn on my learning tools, and just immerse myself with the Chinese characters. My learning accelerated at that point. The exception to this however, is writing on a phone or computer. Pīnyīn is by far the easiest way to type Chinese into one of these devices. I'll also write about the different input editors for computers another day. Author greglowblogPosted on August 18, 2018 September 29, 2018 Categories Learning Chinese (Mandarin)Leave a comment on Learning Mandarin: Should I use Pin Yin while learning? Learning Chinese: Who uses Simplified Chinese Characters? In an earlier post, I discussed the difference between traditional Chinese characters and the simplified versions. What I didn't address in that post, is who uses which, and (importantly) which is best to learn. The answer to this question is changing over time. Adherents to traditional characters point out how much richer many of the characters are. Ironically though, there are characters that started more simplified, but which became more complex over time, and the current simplified character is closer to the historical one. While the note on richness is very true, it's important to keep in mind why the simplified ones were created in the first place. Many in Western countries will still see a lot of traditional Chinese characters displayed on signs, etc. This is for a number of reasons. One is that the calligraphy involved is a significant art form. But the other is that in the past, most of the Chinese diaspora (overseas Chinese) were from Hong Kong and Taiwan ie: regions where people readily traveled overseas in the past. Both these regions, along with Macau, still mostly use traditional characters. Researchers in Taiwan point out the irony in simplification being introduced to assist literacy, yet the Taiwan region has a much higher than average literacy despite using traditional characters. Others question the measurement of literacy on the mainland, and many other studies however, have shown how much easier simplified characters are to learn, contrary to cultural biases. It's interesting that other overseas Chinese communities like those in Singapore, Malaysia, etc. have already switched to using simplified characters. Painful as it might be for some (and it is painful and seen as an assault on cultural identity by many), I see it only as a matter of time before the vast majority use simplified characters. You can find more on the debate here. My take on this (and I'm sure many will disagree) is that you have to look at what the Chinese government is pushing. One thing they are very big on is standardization. With such a gigantic population, there is no other option. And they've said that simplified characters are where they are now, and also where they are heading. Now that's somewhat painful and confronting for those who grew up using traditional characters, but I see it as simple (no pun intended) reality. This means "China already has more than 5000 years of history". While this is a claim that's often disputed, it is one of the items of pride you will hear Chinese people commenting on. They'll ask "how many years of history does your country have?" and proudly commenting on the comparison. While the ability to read historical documents is important, most English-speaking people today would struggle to read English that was written more than a few hundred years ago anyway. Today, I'd suggest learning simplified characters, and over time, picking up traditional characters that you need, as you come across them. Even in the regions that currently use mostly traditional characters, I'm sure that when people need to work or deal with the government, business, etc. that it will be increasingly done using simplified characters. My guess is that within a few generations, the move will be pretty much complete. Author greglowblogPosted on August 11, 2018 July 30, 2018 Categories Learning Chinese (Mandarin)Leave a comment on Learning Chinese: Who uses Simplified Chinese Characters? Learning Chinese: Can't we just translate between simplified and traditional Chinese characters? Last week, I discussed the meaning of simplified vs traditional Chinese characters. I had discussed the differences in them, and pointed out that in most sentences, there are only a few characters that are different between the character sets. So, it would seem that the obvious question is why we can't then just simply translate between the two character sets. Ironically, it is the simplification process itself that has made this difficult. It is quite easy to have a computer translate traditional Chinese characters to simplified ones. The problem is the reverse. This is well-described in the academic paper Key Problems in Conversion from Simplified to Traditional Chinese Characters by Xiaodong Shi, Yidong Chen, and Xiuping Huang. as you can see in the main image above this post. So when you need to translate back the other way, which character do you translate it to? This one is easy for the system as it knows that Táifēng (a typhoon) is a specific thing and knows which character to use. A second part of the challenge though is also shown in the example above. Note that the name Táifēng is somewhat similar to the English word typhoon. That's no accident. It's what's called a 通假 (or Tōngjiǎ) which is called a loan word, based on phonetics, not on the meaning of the characters directly. Loan words are very difficult to translate back to traditional characters because the only context is the loan word itself. These groups of characters often have little meaning by themselves. 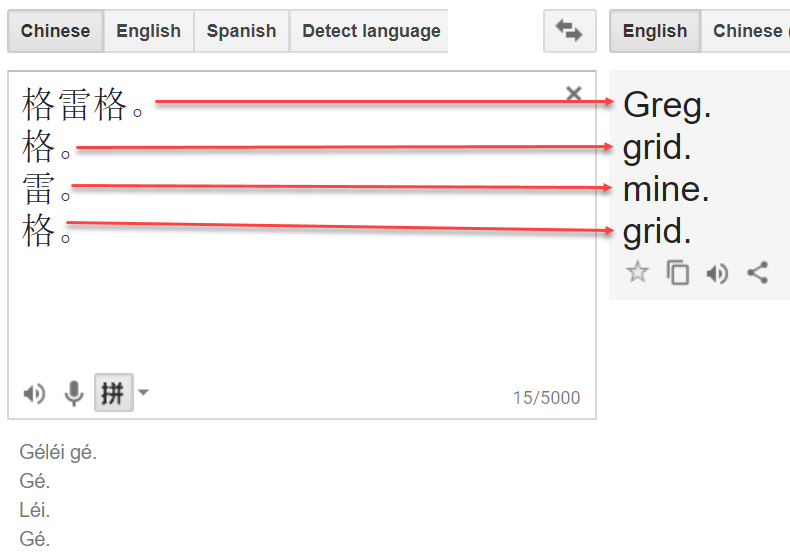 Note that "grid, mine, grid" isn't particularly meaningful on its own. It's only when the entire name is present, that Google Translate has any clue about what it means, and then it's only an "educated" guess. As an interesting side note, it's also why a lot of westerners spend ages trying to find a suitable Chinese name, much the same way that I have Chinese friends who have chosen western names. Author greglowblogPosted on August 4, 2018 August 4, 2018 Categories Learning Chinese (Mandarin)Leave a comment on Learning Chinese: Can't we just translate between simplified and traditional Chinese characters? Learning Chinese: What is Meant by Simplified Chinese? In a recent post, I talked about the benefits I'd gained by learning to read Chinese, or at least getting better at it. 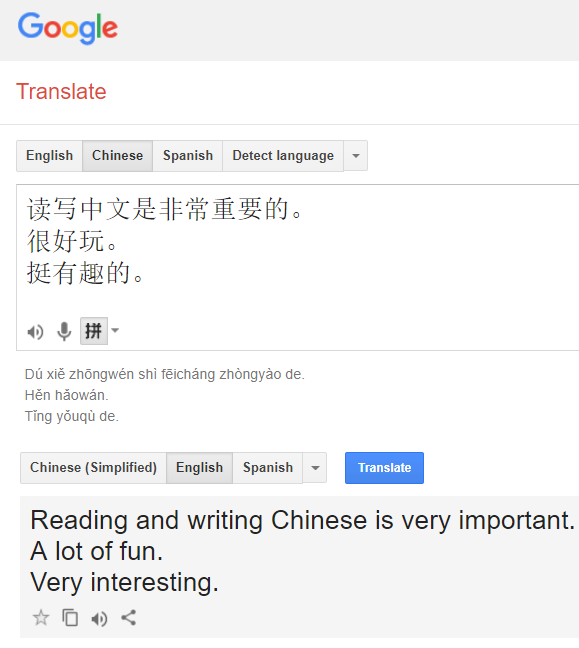 A curious question that I get from people sometimes, is about "learning to read Mandarin". I have to explain that Mandarin is a dialect (as is Cantonese) not a written language. I'll write more about dialects another time. Chinese has a lot of characters. There have probably been upward of 30,000 over the years. Today though, the Table of General Standard Chinese Characters lists 8105 characters. That's a lot of characters to learn. I now know about 1900 and while I can make some sense of newspapers, etc., about 2500 is generally considered a good starting point for readers. One of the challenges for people learning to read and write though was that some characters were pretty complicated. That might be ok if they are uncommon, but not if they are used regularly. To improve literacy, starting in around 1946, the Chinese government decided to make some of them easier. A few hundred common characters were simplified as 简化字 (or jiǎnhuàzì). These are often also called 简体字 (or jiǎntǐzì). In English, we have collective words for groups of things ie: flock of geese, or pack of wolves. Chinese, however, has measure words (量词 or liàngcí). So to say "three fish", you say 三条鱼 (or sāntiáo yú). In this case, tiáo is the measure word for fish (actually it's used for many long thin things). There are many, many measure words, but the most common generic measure word is gè. So if I said "I have a secret", I'd say 我有一个秘密 (or Wǒ yǒu yīgè mìmì). In that sentence, the character 个 (or gè) is the measure word. Look at how far more complex the fourth character is. Same sentence but one different character. 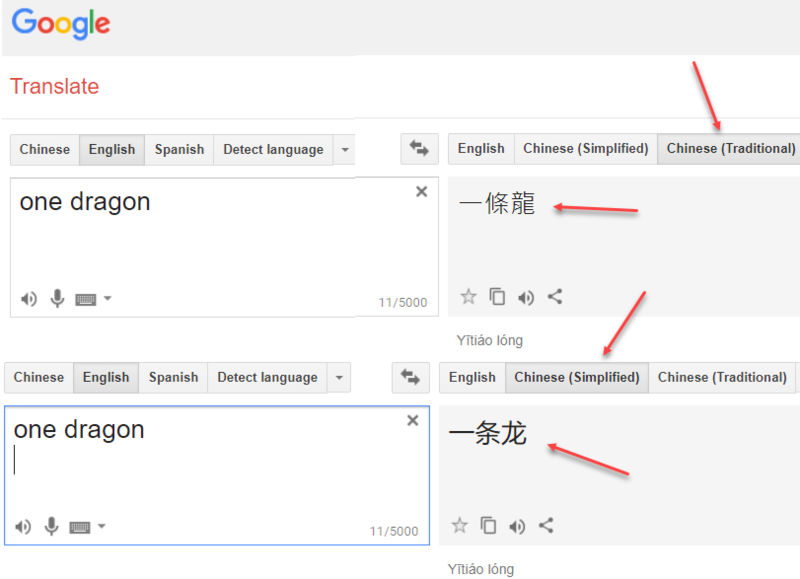 If I say "one dragon", it's 一条龙 (or Yītiáo lóng) in simplified Chinese but in traditional characters, it's 一條龍. You can see why they wanted to make the change. 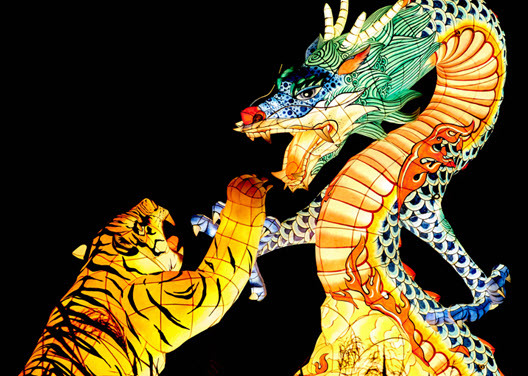 You might also wonder about why they'd simplify a word like "dragon" when choosing common words to simplify, but dragons are surprisingly prevalent in Chinese culture. Anyway, nothing is ever all that simple. Now that we've discussed what they are, in a later post, I'll discuss who does/doesn't use them. Author greglowblogPosted on July 28, 2018 September 29, 2018 Categories Learning Chinese (Mandarin)Leave a comment on Learning Chinese: What is Meant by Simplified Chinese? Learning Chinese: Does learning to read and write matter? I have a lot of Asian friends, and one thing that's always surprised me is the number who can speak, but who cannot read or write. They are perfectly fluent speakers of their language, as they learned to speak from their parents and families, but they never learned to read and write. So when I decided to learn to speak Mandarin Chinese, I was wondering if I should spend the extra effort to learn to read and write. I'm really glad that I decided to learn. Before I started to learn, I hadn't realized that even though there are many dialects of Chinese (over 900 and I'll talk about them more another day), that they pretty much all use the same writing system. They have different words in the different dialects but they typically have the same character with the same meaning. (Note: There are some exceptions to this like Simplified vs Traditional characters which I'll also talk more about another day). This means that learning to read Chinese characters (Hanzi) is even more valuable than you might have realized. This is a character that means "fire". In Mandarin, it's pretty much pronounced somewhat like "haw". 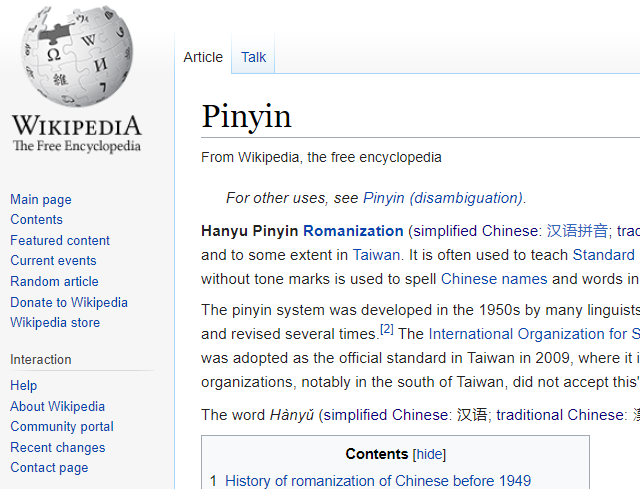 In Pin Yin (which is basically used to write the Chinese characters in our alphabet), it's written as Huǒ. The symbol over the "o" is indicating that the character is pronounced with the 3rd tone (a falling then rising tone). You'll also notice that this pictograph does somewhat show fire. Not all characters are literal drawings like this though. Importantly, if you were speaking another dialect, you would still recognize it as "fire". A Cantonese speaker would call this fo and pronounce it somewhat like "fore". Rather than using strokes to indicate the tone, it might be written as fo2 with the 2 indicating the second tone. (Tones are different in the different dialects too). At high school (many, many years ago), I spent 5 years learning Japanese. Later in life I spent some periods working in Japan. While I could cope with basic greetings, and getting around town, I always was hampered by my inability to read anything complicated. I knew my Hiragana, Katakana, and could use Romaji, but I didn't know enough Kanji characters to get by. Kanji characters are derived from Chinese characters, and are often the same. A big surprise for me when I've been learning to read Chinese was that I can now look at a large number of Japanese signs and know what they mean. I haven't got the slightest idea what the word is in Japanese, but I can often understand the signs. As an example, for the word fire above, Japanese basically uses the same character. They call it ka though. Author greglowblogPosted on July 14, 2018 July 10, 2018 Categories Learning Chinese (Mandarin)Leave a comment on Learning Chinese: Does learning to read and write matter? Anyone that knows me well will have heard me talking at some time over the last few years, about learning Mandarin. At a SQL conference the other day, I had a few people asking me about it because they were interested in learning about it, and a couple wondering why I'd learn it in the first place. The first reason for this is how prevalent the language already is and how much more prevalent it will be. I often see statistics that talk about the most common languages in the world, and invariably they count how many countries speak the language. English fares well in those comparisons. But if you look at the number of native speakers of the different languages, it's quite a different story, particularly when projected forward. The aspect that I hadn't considered was birth rates. They argued that 1 in 4 children born will be native Mandarin. And 1 in 5 will be native Spanish speakers. (This is in no short part caused by the large number of large Catholic Spanish-speaking families in South America where some people are still having 8 or 10 children. In many English speaking countries, the native English speakers aren't even replacing themselves – with 1.3 or 1.4 children per couple). Now many people will say "oh but there are lots of Chinese dialects". That's true. In fact there are over 900 well-recognized dialects of Chinese. What's important to understand though is that the Chinese government is big on standardization. They even have a single timezone right across the huge country, but you have to do that when you have so many people. As hard as it is for less common dialect speakers to deal with, the game is over and down the track, it's all Mandarin. Cantonese is the next most common, and is still the dominant language in Hong Kong. I'm sure it's hard for them to accept but right from the moment Hong Kong was handed back to China, the writing has been on the wall for the language. Children there learn Mandarin from a very young age, and I'm sure over time, that if they want to deal with government, business, etc. it will be Mandarin. Even here in Melbourne, when I'm on trains, I used to hear mostly Cantonese. Now almost all I hear is Mandarin. The positive thing here is that the different dialects share a common writing system (with some differences that I'll describe another day). 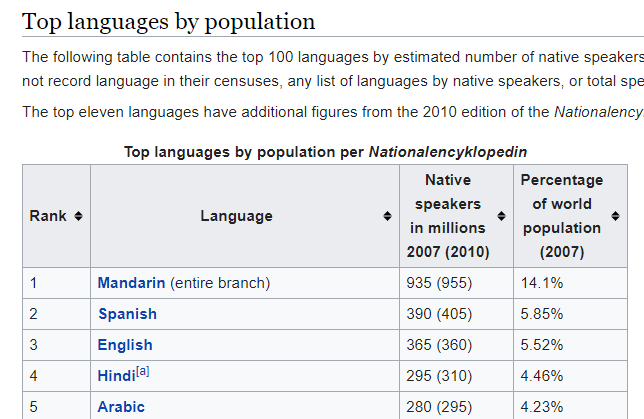 By the numbers, I've also seen projections that say that if you could speak Mandarin, Spanish, and English, by then you'd be able to communicate at some level with over 90% of the world. I'll write more next week on methods for learning. If you want to get a taste for it in the meantime though, my current favorite is Tutor Ming. If you decide to try it, click here and it's a bit cheaper for you, and for me. One argument is that technology will replace the need for learning languages. I don't think that's the case, and I'll discuss that further later too. I had a former colleague ask me the other day if he should learn Cantonese or Mandarin. He was going to spend a few months in Hong Kong and southern China. Here are my opinions. I’m sure there are many who might differ but this is how I see it today. Hong Kong is a tricky one. A large number of people there can speak Mandarin given the difficult relationship between “mainland” China and Hong Kong, even locals who can speak it don’t treat you the same as if you speak Cantonese. Many just aren’t happy about aspects of how China now runs Hong Kong. But the way that I see it, is that resist as they might, they will be “integrated”. In the meantime, and probably for another generation, Cantonese is certainly where it’s at. Already though, China makes all children in Hong Kong learn Mandarin. People don’t seem to understand how determined the Chinese government is to achieve standardisation. In the end, it’s the only way you can run such a large country without anarchy. They even have a single time zone for the whole of China. I can’t see any chance of them supporting 900 or so dialects going forward. It would probably scare the Cantonese speakers today to think about it, but I think that eventually Cantonese will be like Aboriginal languages are in Australia: more of a curiosity. Clearly, that will take some time. Personally, I wouldn’t put any effort into Cantonese but you might decide differently if you are intending to be in a majority Cantonese-speaking country for quite a while. You certainly get treated better by locals if you use at least some of their dialect. Same thing happens in Shanghai. Add some Shanghai-ese into your Mandarin, and they are so happy. Another thing I’ve liked about learning Chinese is that the writing system is essentially the same for all dialects. So even when I see signs written in Hong Kong, I can still read most of it. I have no idea what the words are in Cantonese (although I can easily guess some), but I know what the sign means, and that’s what counts the most. The challenge with Chinese reading and writing is simplified vs traditional systems. In the 1950’s and 1960’s, the Chinese government decided to simplify the writing system as they had so many people that were illiterate. So they took a bunch of characters and made simplified versions of them. The simplified ones are now used widely. However, once again, Hong Kong is a hold-out. Most people in Hong-Kong or Taiwan still use traditional characters. So there are some characters that I have to stop to try to work out what they are. The younger people in Hong Kong are learning Simplified characters. Other countries like Singapore have standardised on Simplified. Even in the middle of China, however, there are movements to try to reinstate Traditional characters as they are seen as more meaningful. I can’t see that prevailing and simplified characters will be the future. Most older Chinese writing that I see in Australia is Traditional as many of the Chinese that originally came here did so from Hong Kong, and many came before Simplified writing was introduced. Most new Chinese that you see in Australia is Simplified. That’s what all the Chinese tourists and students tend to use. When I ride the trains in Melbourne, I used to predominantly hear Cantonese. Now I predominantly hear Mandarin, largely due to an influx of people from other areas of China, and particularly due to younger students. I’ve got other posts that I’ll update soon, on the other methods that I’m using, but the online lessons (my current teachers are from ShenZhen) have increased my abilities the fastest of any method that I have tried. And I just speak to every Chinese person that I get an opportunity to do so.